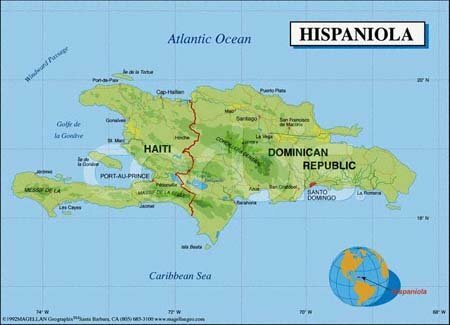 La Hispaniola - the two colonies in Dominican history. The story of the division of the Island into two colonies began during the seventeenth century some two hundred years after the whole island had remained solely under Spanish rule. The Spanish had vacated the western third of the island in an attempt to cut down on the colonists' trade with Dutch merchants who violated Madrid's trading policies. They were ordered to the eastern part of the island, where officials in the capital city of Santo Domingo could better observe them. The abandoned western portion of the island was now available for the use of the French buccaneers. The French, by now a European super-power, saw an opportunity to colonise part of this promisingly wealthy island, and introduced female prisoners to encourage domestic French settlement, a first colony being established in 1664. However, not until 1697 was the western third of the island legally ceded to France by the terms of the Treaty of Ryswick (which was the settlement of the War of the Grand Alliance between France and England, Spain, the Holy Roman Empire and the United Provinces of the Netherlands). As piracy was gradually suppressed, some of the French adventurers became planters, making Saint-Domingue (as the French portion of the island was known - the "pearl of the Antilles" -) one of the richest colonies in the 18th century French empire. Saint-Domingue produced about 40 percent of all the sugar and 60 percent of all the coffee consumed in Europe by the 1780s. This single colony, roughly the size of Maryland or Belgium, produced more sugar and coffee than all of Britain's West Indian colonies combined. It became one of the wealthiest in the Caribbean, but only through the heavy importation of African slaves and considerable environmental degradation. In the second of the two colonies, Spanish Santo Domingo, however, the landowners did not enjoy the wealth attained by their French counterparts. Market forces did not require increased production and exports were at a low level. Consequently, the labour force was enabled to practice subsistence farming. Fewer slaves were imported, and new Spanish laws allowed slaves to purchase their freedom for a relatively small sum. There were, therefore, a higher proportion of freedmen who, by the turn of the century, constituted the majority of the population. This contributed to a society less troubled by racial prejudice.